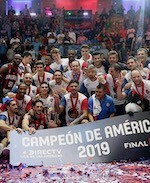 Franca cruised past Real Esteli for the second straight win in Mexico City. Didi Louzada (195-G/F-99) posted 27 points and 6 rebounds for the winners. Franca accumulated a 45:28 halftime lead. Franca unloaded 55 points in the second half and raced to the win. David Jackson (195-SG-82, college: Penn St.) delivered 17 points for the winners. Kevin Foster (203-PF-89, college: Fresno St., agency: Haylett Sports) replied with 22 points for Real Esteli. Capitanes outgunned Mexican rivals Soles to stay undefeated in Group B. Rigoberto Mendoza (190-G-92) had 22 points, 8 rebounds and 5 assists for the winners. Capitanes recorded a 41:35 halftime advantage. Soles erased the deficit in the third term as both teams entered the fourth frame tied at 54. However Capitanes went on a 21:16 run in the final stanza to seal the win. Ismael Romero (203-C-91) had 14 points and 12 rebounds for the winners. Branden Dawson (198-F-93, college: Michigan St.) replied with 15 points and 11 rebounds for Soles.